Following a solo exhibition of portraits at the National Portrait Gallery in 2014, Catherine Goodman exhibits new larger landscapes and figures at Marlborough Fine Art. Juxtaposing portraits of people and objects alongside large-scale landscapes and subjects drawn from film, this exhibition reveals different facets of Goodman’s creative imagination and its rich range of references drawn from life and art. 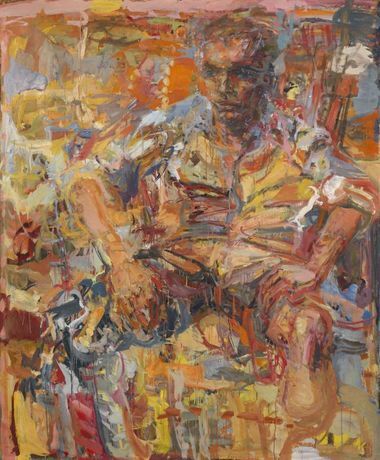 Some of the images from the National Portrait Gallery exhibition reappear – including Harry Parker, soldier, Afghanistan veteran, and acclaimed novelist – in a much less literal image in gestural oranges and reds. Moving freely between different genres, this exhibition reveals the scope of Goodman’s imaginative life and the ways in which she harnesses memory and narrative in her response to the world as a painter. The diverse landscapes of Tuscany and the Himalayan mountains in India where she has painted for many years, continue to feed her recent works. Huts, palapas, and poplar trees become powerful presences in scenes where a sense of spatial ambiguity often makes the landscape seem unfamiliar. 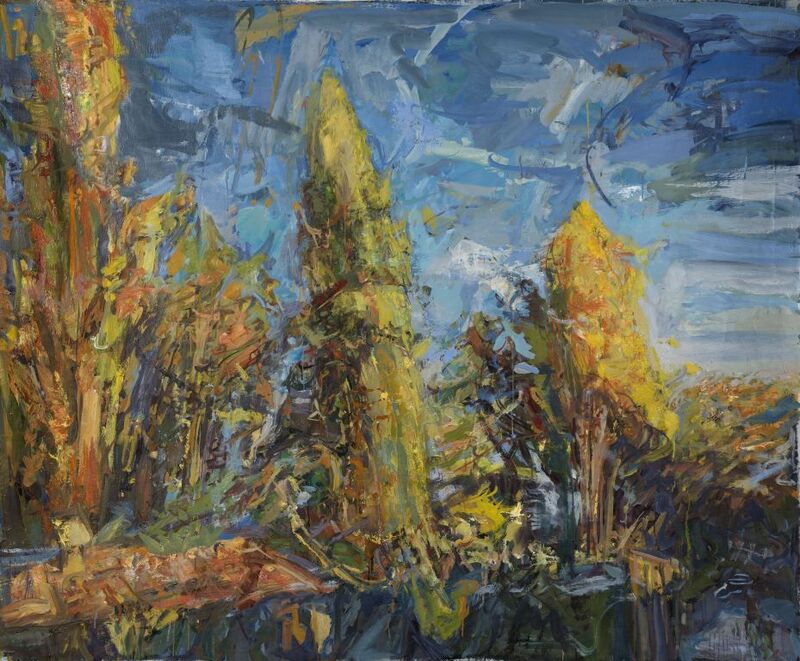 Typically painted from life on un-stretched canvas, her works are layered with imagined scenes and memories in the studio, without losing the immediacy of her original encounter with the subject. Drawing has always been a fundamental component of Goodman’s practice, pursued alongside and invigorating her painting. Included in the exhibition are several works on paper created with pastels and paint sticks. Their subject matter and dynamic expressivity is closely connected to the larger canvases where she uses oil paint applied in bold brush strokes overlaid with animating skeins of colour. As the Artistic Director of the Royal Drawing School, which she founded with HRH The Prince of Wales in 2000, Goodman is an advocate for the importance of drawing, and continues to assert its relevance in contemporary practice through her work and teaching. Deeply engaged with the history of art, she has spent every Saturday for the last six years drawing from Old Master paintings in The National Gallery, including Veronese, Titian, and Michelangelo. Drawing from film is an extension of drawing from art for Goodman and she sees the great twentieth century filmmakers including Andrei Tarkovsky and Federico Fellini as great artists in their own right. 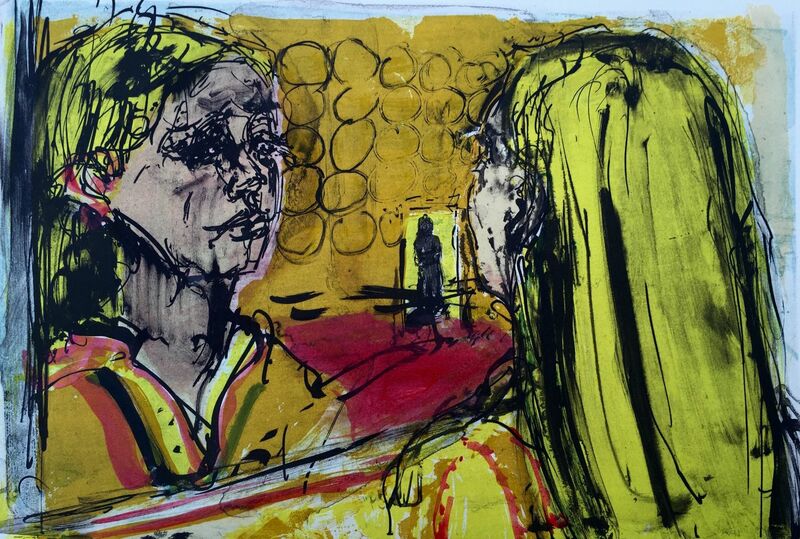 In a new series of lithographs – the first she has produced since studying at Camberwell in the 1980s – Goodman directly references Fellini’s comedy 8½ (1963) and Tarkovsky’s The Mirror (1975) in brightly coloured prints with figures emboldened by thick black lines. A cast of characters mingling memory and fiction leave their trace in many of the works in this exhibition, including a large mirror painting and a close up image of Orson Wells, who fixes our gaze as Falstaff in Chimes at Midnight (1967). A fully illustrated catalogue will be published to coincide with this exhibition. Hannah Rothschild, filmmaker, writer and Chairman of the National Gallery, and Andrea Rose, former Director of Visual Arts at the British Council, will both contribute essays to the catalogue; the exhibition will also be curated by Andrea Rose in partnership with Geoffrey Parton of Marlborough Fine Art. Catherine Goodman (born in 1961) lives and works in London. She trained at Camberwell (1979-84) and the Royal Academy Schools (1984-87) where she won the RA Gold Medal (1987). She was awarded the National Portrait Gallery’s BP Portrait Award (2002) for her painting of Antony Sutch and as part of the First Prize, the National Portrait Gallery commissioned a portrait of Dame Cicely Saunders (2004-5). 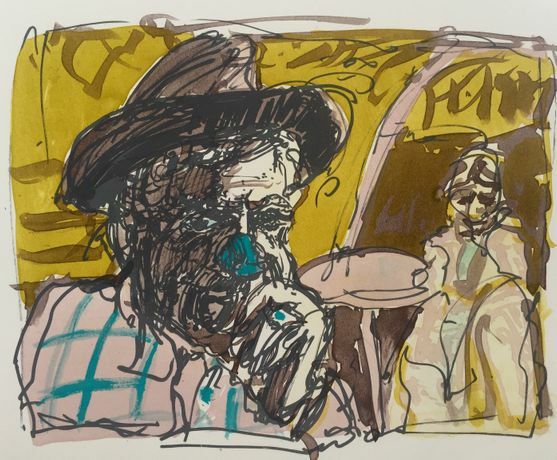 Following Goodman’s 2014 solo exhibition Portraits from Life at the National Portrait Gallery, in 2015 the gallery acquired her portrait of film director Stephen Frears for the permanent collection. Previous solo exhibitions of Goodman’s work include exhibitions at Marlborough Fine Art London and in 2014 at Colnaghi London with Drawing from Veronese. The Royal Drawing School is an independent, not-for-profit resource that aims to raise the standard and profile of drawing through teaching and practice. Drawing is a primary language natural to all human beings, and fundamental to all aspects of learning and thinking from childhood onwards. It is a crucial route to innovation across the creative disciplines and beyond, from fashion, fine art and animation to filmmaking, product design and engineering. For some people, drawing is the easiest way of thinking. As one of only a few institutions in the world offering in-depth, quality tuition in drawing from observation, the School aims to fill a gap left by the steady erosion of observational drawing from the study of art in higher education and in schools.